Be careful to ensure this camera is safely fitted to a surface when installed and follow these instructions. Do not attempt to dismantle without authorisation. In order to prevent sensor degradation/damage, do not expose lens to intense light source or directly at sunlight for long periods of time. Do not touch sensor directly. Protect with a dust-proof cover when the camera is not being used. Use a dry soft cloth to clean the camera. If dirt is difficult to remove from the camera, use a small amount of detergent with water then wipe the camera dry. Disconnect all electric power sources when not in use, during installation, cleaning, maintenance. When transporting, using and storing the camera; do so in allowable temperature and humidity. If the camera was broken on arrival; for example: the power cord or plug is damaged, or there is liquid or foreign matter in the camera, then please contact your supplier or MaxxOne support. Note: self-modification and maintenance are not permitted, and you will be responsible for problems that arise. Allows you to choose from several AE settings that automatically select the appropriate shutter speed and/or aperture based on the camera environment conditions. Allows you to choose from pre-set white balance modes that help adjust the screen colour to ensure that the best possible picture is captured. Allows you to use this camera in varying conditions of back-lighting, very bright, or very dark areas whilst still maintaining a clear image. Camera Gamma characteristic is 0.45. Check and test your power supply for faults or voltage abnormality. Check the power supply voltage is sufficient for the camera. Check that all cables and monitors are connected correctly. This may be caused by the power supply AC ripples, or from other cables nearby causing external interference. Make sure your cables and connections are properly insulated or use a filter such as a ground loop isolator to eliminate the problem. Check the monitor and peripheral equipment used for similar problems. Nearby fluorescent lighting can interfere with cameras causing the colours on screen to change. Positioning the camera further away or reducing the number of fluorescent lighting nearby will improve picture quality. The power supply’s voltage may be unstable. Cables may not be connected correctly or have a high impedance. 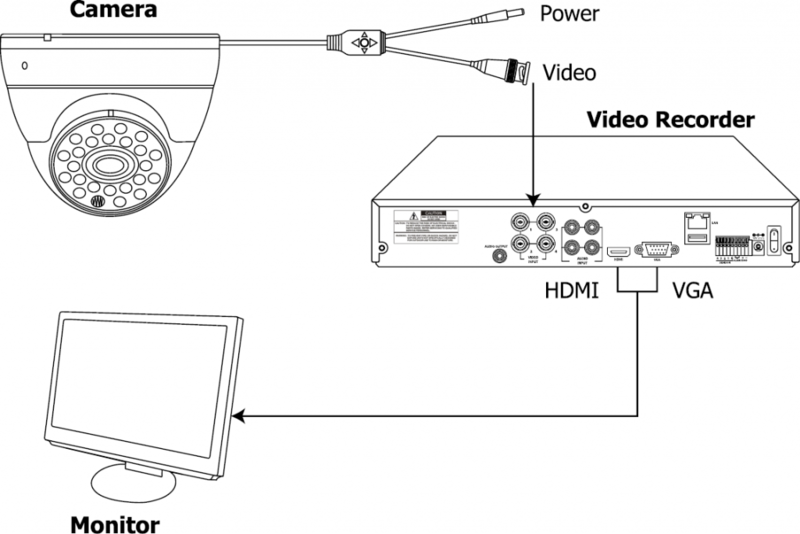 Check that your camera is set to the same video format as your DVR. Do not mount the camera nearby a radiator or heater.